WE SELL AFFORDABLE EARTHING SHEETS AND PILLOWCASES THAT CAN DRAMATICALLY ENHANCE YOUR HEALTH, SLEEP & WELL BEING. Earthing involves connecting your body to the Earth’s eternal and gentle surface energy. Quite simply Earthing is walking barefoot outside and/or sitting, working or sleeping inside while connected to a conductive device that delivers the natural healing electrons of the Earth into your body. Until recently, humans spent a great deal of time in contact with the ground. This contact may have served an important purpose. Although it sounds like something from a sci-fi novel, Earthing—the act of physically connecting our bodies to the Earth—allows us to reset body’s natural electric charge. Research is finally beginning to back up the benefits of Earthing on our bodies health and emotional well-being. We all instinctively feel how wonderful it is to wiggle our toes in grass, sink our fingers into the rich, crumbly soil of our garden, or walk barefoot on the sand. Research has shown that it takes 45 minutes to have a complete electron flush through the body. With our busy lives these simple pleasures are not always available to us each day (or even at all for some) and we are missing out on vital, natural, health enhancing Earthing. Our modern urban lifestyles have taken us away from the natural force of the Earth’s healing Energy. Thanks to modern science and technology there is now a simple way to Earth ourselves each time we sleep. The Global Gypsy is importing high quality and cost effective Earthing Sheets and Pillowcases from China. They are an affordable home accessory that you plug into the grounded port in your bedroom’s electrical outlet. These sheets allow you to gain the benefits of Earthing while you sleep. They are designed so that your skin has direct contact to the conductive silver fibres in the sheets and pillowcases. Just make your bed as normal and enjoy the benefits of getting yourself Earthed as you sleep. HOW DOES EARTHING OR GROUNDING HELP US? (All Prices here are in Australian Dollars). Do you notice you feel better when you walk barefoot on the Earth? Electrons from the Earth have antioxidant effects that can protect your body from inflammation and its many well-documented health consequences. For most of our evolutionary history, humans have had continuous contact with the Earth. Electrons meet your red blood cells and makes them negatively charged and so they repel each other circulating your blood properly the way humans have evolved on this planet. Fifty years ago we switched from leather soled shoes through which electrons can move to insulated shoes which they cannot. It takes 45 minutes to have a complete electron flush through the body, which is why you should take your shoes off and get grounded when you fly to a different time zone and then you reset and avoid jet lag. When you lie on the grass or beach you feel really earthed after only about 15 minutes because the electrons are entering your body at each point of contact. Which is what the sheets do through every point of contact with the skin . It is only recently that substances such as asphalt, wood, rugs, houses, cars and plastics have separated us from this contact. It is known that the Earth maintains a negative electrical potential on its surface. When you are in direct contact with the ground (walking barefoot, sitting, or laying down on the earth’s surface) the earth’s electrons are conducted to your body, bringing it to the same electrical potential as the earth. Living in direct contact with the earth grounds your body, inducing favorable physiological and electrophysiological changes that promote optimum health. There is an emerging science documenting how conductive contact with the Earth, which has is also known as Earthing or grounding, is highly beneficial to your health and completely safe. Earthing appears to minimize the consequences of exposure to potentially disruptive fields like “electromagnetic pollution” or “dirty electricity.” As so many of us live and work in urban areas with technology all around us Earthing is more important than ever to counteract the negative energy fields that modern technology transmits and gets absorbed in our bodies. This information can be found on Mercola.com. More detailed information about the benefits of Earthing can be found on The Earthing Institute website (http://www.earthinginstitute.net/). Both David Suzuki and Dr Deepak Chopra have endorsed earthing. This pad is very soft with a thicker silver fibre woven into it. It works well also as a Pet Bed. Many dogs are getting arthritis and not living as long but many also are stuck inside houses and only getting a few minutes of earth time each day. An experiment was done on some dogs given two of these plush pads and they were periodically changed and no one told the dogs which one was plugged in, Yet they always went to sit on the mat that was connected to earth. This washes in the washing machine. This is great for anyone in an office situation to use as a mouse pad to earth your hand and body or as a foot pad for under your desk. This then eliminates the voltage from electro magnetic fields produced from computers, screens and power sources. Long term exposure to high EMF fields is not good for human DNA. When you earth yourself this EMF is drained through you to earth and then the electrons do their magic and come back through the plug negatively charging your blood cells and helping your auto immune system. If you practice some form of healing where you can earth yourself on a foot pad you can then earth your clients when you touch them. 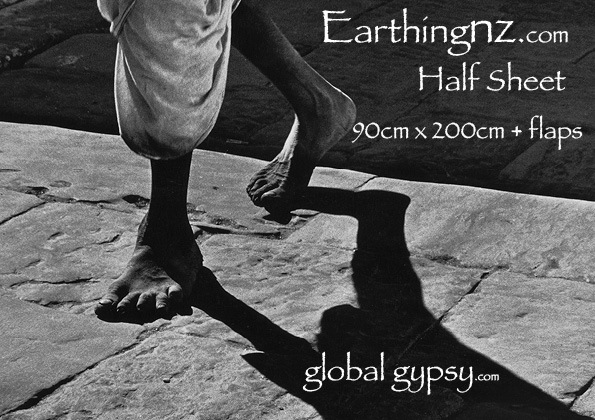 Global Gypsy does not make any health claims directly however research shows incredible benefits of Earthing, and there are countless positive responses from all who Earth themselves on a regular basis. NEVER DISREGARD THE ADVICE OF YOUR DOCTOR OR DELAY SEEKING MEDICAL TREATMENT BECAUSE OF SOMETHING YOU HAVE READ ON OR ACCESSED THROUGH THIS WEB SITE. The contents of this website is provided for general informational purposes only. The contents are not intended or implied to be a substitute for professional medical advice, diagnosis, or treatment. If you are under the care of a physician for any health condition, consult with your physician first before starting Earthing, and especially if you take medication. Contact with the Earth’s natural electrical field can affect the physiology in many ways. Those on Warfarin and other blood thinning medications and thyroid meds would need to consult a doctor within a week of using earthing sheets as your body’s blood naturally starts to flow better and many will find that they need to reduce their medication and sometimes go off them permanently. Gerar Toye, The Global Gypsy makes no representation about the efficacy, appropriateness, or suitability of any specific tests, procedures, treatments, services, opinions, health care providers, or other information that may be contained on or available through this web site, nor that the information on this site will produce specific results for any individual. Gerar Toye, The GlobalGypsy is not responsible or liable for any advice or any other information that you obtain through this website. Always disconnect your earthing sheet when there is lightning or electrical storms in your area. They are easy to wash, just unplug and put in washing machine with a basic detergent.Itneeds a detergent to keep the silver fibres clean and conductive. Do not use chlorines or bleaches, nappy san, or oxy whitening conditioners (Nappy San), softening agents or dry cleaning . Air dry, i.e. Do not use a clothes dryer or if you do use a low heat setting. All of these will ruin the conductivity of silver fibres. Do not use essential oils. I have just tested my daughters pillowcase and found it is not working after a year but she has been using a lot of products in her hair like spraying dry shampoo which has damaged the conductivity whereas the sides of the pillowcase still show they work. Recently, a group of about a dozen researchers (including the authors of this paper) has been studying the physiological effects of grounding from a variety of perspectives. This research has led to more than a dozen studies published in peer-reviewed journals. While most of these pilot studies involved relatively few subjects, taken together, the research has opened a new and promising frontier in inflammation research, with broad implications for prevention and public health. The findings merit consideration by the inflammation research community, which has the means to verify, refute, or clarify the interpretations we have made thus far. Photographic images documenting accelerated improvement of an 8-month-old, non-healing open wound suffered by an 84-year-old diabetic woman. Rapid recovery from a serious wound with minimal swelling and redness expected for such a serious injury. Reduction in inflammation with grounding or earthing documented with medical infrared imaging. Our main hypothesis is that connecting the body to the Earth enables free electrons from the Earth’s surface to spread over and into the body, where they can have antioxidant effects. Specifically, we suggest that mobile electrons create an antioxidant microenvironment around the injury repair field, slowing or preventing reactive oxygen species (ROS) delivered by the oxidative burst from causing “collateral damage” to healthy tissue, and preventing or reducing the formation of the so-called “inflammatory barricade”. We also hypothesize that electrons from the Earth can prevent or resolve so-called “silent” or “smoldering” inflammation. If verified, these concepts may help us better understand and research the inflammatory response and wound healing, and develop new information on how the immune system functions in health and disease. One of the first published grounding studies examined the effects of grounding on sleep and circadian cortisol profiles.5 The study involved 12 subjects who were in pain and had problems sleeping. They slept grounded for 8 weeks using the system shown in Figure 4. During this period, their diurnal cortisol profiles normalized, and most of the subjects reported that their sleep improved and their pain and stress levels declined. The results of the experiment led to these conclusions: 1) grounding the body during sleep yields quantifiable changes in diurnal or circadian cortisol secretion levels that, in turn, 2) produce changes in sleep, pain, and stress (anxiety, depression, and irritability), as measured by subjective reporting. The cortisol effects described by Ghaly and Teplitz5 are particularly significant in the light of recent research showing that prolonged chronic stress results in glucocorticoid receptor resistance.6 Such resistance results in failure to downregulate inflammatory responses, which can thereby increase risks of a variety of chronic diseases. This effect complements the findings described in the “Effects on pain and the immune response” section. A pilot study on the effects of grounding on pain and the immune response to injury employed delayed-onset muscle soreness (DOMS).7 DOMS is the muscular pain and stiffness that takes place hours to days after strenuous and unfamiliar exercise. DOMS is widely used as a research model by exercise and sports physiologists. The soreness of DOMS is caused by temporary muscle damage produced by eccentric exercise. The phase of contraction that occurs when a muscle shortens, as in lifting a dumbbell, is referred to as concentric, whereas the phase of contraction as a muscle lengthens, as in lowering a dumbbell, is referred to as eccentric. Changes in afternoon (PM) visual analog pain scale reports. Changes in afternoon (PM) pain levels using a blood pressure cuff. Comparisons of white blood cell counts, comparing pretest versus post-test for each group. Comparisons of neutrophil counts, pretest versus post-test for each group. Comparisons of lymphocyte counts, pretest versus post-test for each group. Normally, neutrophils rapidly invade an injured region8,20–22 in order to break down damaged cells and send signals through the cytokine network to regulate the repair process. Neutrophils’ production of ROS and reactive nitrogen species (RNS) is termed the “oxidative burst”.21 While ROS clear pathogens and cellular debris so that the tissue can regenerate, ROS can also damage healthy cells adjacent to the repair field, causing so-called collateral damage. The fact that the grounded subjects had fewer circulating neutrophils and lymphocytes could indicate that the original damage resolved more quickly, collateral damage reduced, and the recovery process accelerated. This would explain the reduction in the cardinal signs of inflammation (redness, heat, swelling, pain, and loss of function) following acute injury, as documented, for example, in Figures 1 and ​and2,2, and the rapid reduction of chronic inflammation documented in Figure 3. Formation of the inflammatory barricade. Selye30 studied the histology of the wall of the inflammatory pouch or barricade (Figure 10). It is composed of fibrin and connective tissue. Our hypothesis is that electrons can be semi-conducted across the barrier, and can then neutralize reactive oxygen species (free radicals).30 A semiconducting collagen pathway or corridor may explain how electrons from the Earth quickly attenuate chronic inflammation not resolved by dietary antioxidants or by standard medical care, including physical therapy (Figure 3). The barricade probably restricts diffusion of circulating antioxidants into the repair.